KUALA LUMPUR (Oct 21): Trading of shares in CIMB Group Holdings Bhd ( Financial Dashboard), RHB Capital Bhd (RHBCap) ( Financial Dashboard) and Malaysia Building Society Bhd (MBSB) ( Financial Dashboard) have been suspended from 2.30pm today, pending an announcement. 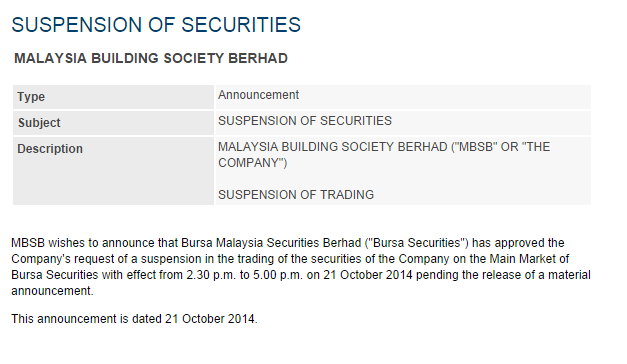 "Kindly be advised that at the request of the company, trading in its securities will be suspended with effect from 2.30pm on Tuesday, October 21, 2014, pending an announcement," CIMB, RHBCap and MBSB told Bursa Malaysia in three separate filings this afternoon. Prior to the suspension, CIMB shares closed 13 sen or 2% lower at RM6.41. MBSB was unchanged at RM2.60, while RHBCap rose 4 sen or 0.5% to RM8.52. TheEdge Markets.com reported that Bursa Malaysia Bhd ( Financial Dashboard) was expected to disallow the Employees Provident Fund (EPF) to vote in the proposed merger of CIMB, RHBCap and MBSB. The report quoted sources as saying: "Bursa was not willing to make an exemption to allow EPF, which has interests in all three financial institutions, to vote." According to the report, Bursa's listing committee is meeting today on the matter.